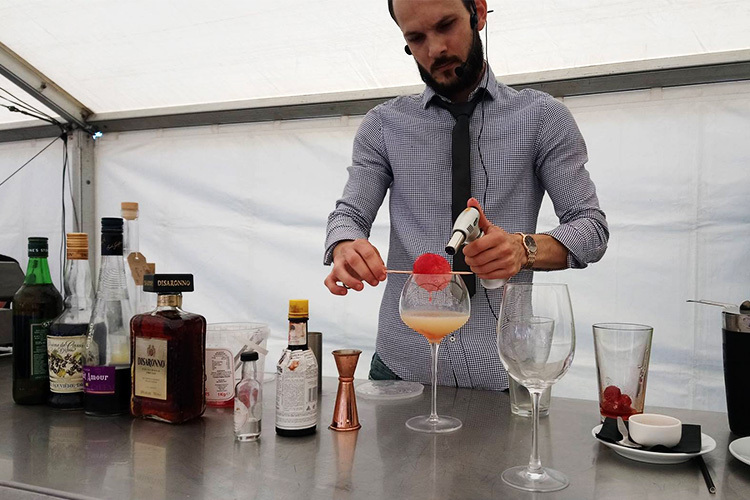 At the end of each summer, residents of our home island of Guernsey get to enjoy a week of inventive mixology and cut-price cocktails as bars across the Bailiwick take part in Guernsey Cocktail Week. We’re always honoured when Wheadon’s Gin is featured in the special cocktails that each venue offers throughout the course of the week, particularly for the creations entered in the Guernsey Cocktail Competition that draws the week to a close. This year, Jorge from our home bar at the Bella Luce Hotel entered a creation named “The Bloody Bella” and made it through to the final five which meant demonstrating his creation live on stage at the Guernsey Food Festival in front of judges James Le Gallez (Haut Maison), Ross Gledhill (White Rock Brewery) and our own Luke Wheadon (Wheadon's Gin). Being that the Bella’s bar is mere metres from where we distill Wheadon’s Gin, we got to witness the development of Jorje’s recipe and method and ask him about his cocktail in order to share it with you. The Bloody Bella was served with a side of liqueur caviar - not the caviar one might normally be used to, but a bar caviar made from different liqueurs and showcasing Jorge’s skills as a molecular mixologist. His bar caviar was made with parfait d’amour, creme de mûres, a ginger sweet & sour syrup, a the syrup produced from brûléeing cherries that had been soaked in a special bergamont and tangerine Wheadon’s gin. Jorje makes the Bloody Bella by dry shaking (shaking without ice) 40ml of Wheadon’s Gin with a short measure of home-made gingery sweet and sour and a partial barspoon of honey whilst chilling a wine glass with ice. He then adds a dash of Amaretto, a touch of Chartreuse, a touch of ginger wine and finally blood orange juice, tops with ice, and shakes (this is the wet shake). This is then strained into the chilled wine glass (having discarded the ice that was being used to chill the glass) and garnished with a slice of dried blood orange and flamed homemade honeycomb, before being served with Jorje’s bar caviar. The Bloody Bella was well received by the judging panel, and whilst creating bar caviar or the homemade ginger sweet and sour syrup might be a bit much for most home enthusiasts, we’re sure that if you were to head to the Bella and ask him nicely, Jorje would be happy to mix one up for you.